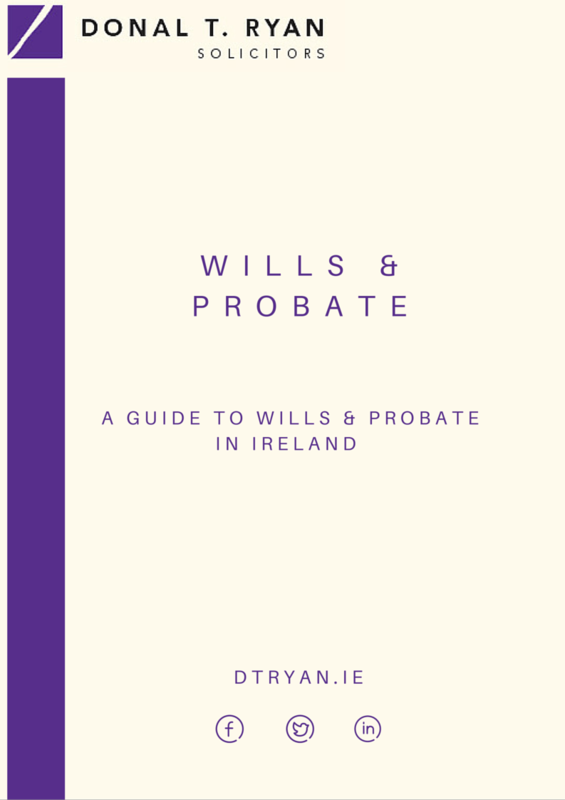 We, at Donal T. Ryan Solicitors, acknowledge and understand that the making of a will or the administration of an estate can be fraught with anxiety, worry and distress. We commit to you that we will make this process as seamless as we possibly can and ease any burden of anxiety you feel. We are here to guide you though the process of the initial drafting of the will and guiding you through the relevant processes in order to administer an estate or deal with any issues that may surround an estate or arise therein. A will is essential to ensure that you get a say as to how your assets pass on your death and to appoint executor or executors to arrange for administration of your estate. If you do not put a will in place the Law will decide as to who your assets will pass to and in what portion and you have no say in this regard. We will meet with you, assist you and advise you as to the structure of your will in terms of setting out your final wishes and advising on the legal and tax issues that may arise. We will also provide you with advice in order to ensure that your wishes are made clear to both your executors and your beneficiaries. We will meet you at our Office or if you are unable to attend at our Office we do carry out home visits. By making a will you will benefit from the peace of mind which comes from knowing that you have provided for your chosen beneficiaries’ future. We can guide you as to the necessary steps involved in dealing with the affairs on the passing of a loved one. We will deal with all the banks, financial institutions, creditors, Revenue Commissions and Government Departments in order to assist you through the maze with is involved in the administration of a deceased estate. We appreciate that a time of bereavement is a difficult period and we will assist you in a friendly, compassionate and professional manner. We also offer services to clients to provide independent legal advice on all issues surrounding wills, estates and administration of same such as advising spouses, children, legal personal representatives and beneficiaries in relation to their rights under the legislation should they be unsure as to their legal position. In addition, we advise in relation to disputes arising from contested wills or during the administration of the estate, challenges to validity of a will, undue influence or any deemed inadequate provision under an estate. As part of our overall probate services we have the knowledge and expertise to advise on inheritance tax, estate planning, Enduring Powers of Attorney, Wards of Court, Fair Deal Scheme and we will provide you with a confidential service which is provided in terms of quality advice, a client friendly approach and we ensure attention to detail at every step of the process.